Marie Torr grew up in northern Hawke’s Bay, moving to Napier in her teens. She now works in sales in the city. Having never given up on moving back to the country, in mid-2016, she sold her house and began looking for a rural property to build on. "It took me a few months and, after looking in and around Tikokino and Tutira, I was becoming impatient, then I found Doug and he suggested looking here. It was perfect, and I have not looked back,” she says. 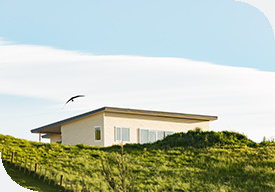 ‘Doug’ is Doug Harvey of PGG Wrightson Real Estate, Waipukurau, and ‘here’ is Highlands of Waipawa, a new 27-lot subdivision that he is marketing on the northern boundary of the Central Hawke’s Bay town. That was in February. Now set to move into her new house in November, the property is an ongoing project for Marie. “I am excited about the freedom to do whatever I want here. I have grand plans for chickens, a vege garden, and some fruit trees. I’m also going to do something around animals with four legs. Marie loves the aspect of her section. “I overlook a little pond. I’m looking forward to seeing ducks and other wildlife on there, and to growing some trees around it,” she says. She also really appreciates the flexible covenants on the land. “They are realistic, as not everyone wants to build a massive house. They also provide protection to retain the value of the land, for example planting large trees, to ensure nobody’s view is blocked out,” she says. Father and son, Brian and Alistair Setter have developed Highlands of Waipawa, which has been eight years in the making. Alistair agrees that non-restrictive covenants are important. “We have been able to create sections that vary in size. Ensuring a sense of space between the building platforms was a priority, maintaining the feeling of a rural lifestyle, reassuring people that their views will not be compromised. Some people want more land to run horses or whatever, and everyone wants space. That has been the key to the conditions we have put on the subdivision,” says Alistair. One covenant declines relocatable houses, though the developers reserved the flexibility to over-rule that and give permission when a house is suitable, which they have done in one instance. Doug Harvey says almost half of the 27 sections have sold. “Largely unrecognised on a national scale, Waipawa, which has a population of around 2,000, probably qualifies as a hidden gem. “Moderate winters and balmy summers enable locals to enjoy river fishing, horse riding, country walks and cycleways, sportsgrounds and pools, big game and bird hunting and beautiful coastal beaches within close proximity,” he said. Alistair says regular sales in the past year indicate the subdivision’s pricing is about right. “We deliberately set pricing at an affordable market rate, while not offering discounts. We are motivated to look after those who have already purchased, and respect their commitment to the subdivision,” he said. Marie is delighted with the welcome she has received from the Waipawa community. “My new neighbours are all fantastic. I went to introduce myself and they were all hugging me. Doug has been really helpful, keeping an eye on how my build has gone, and looking out for me, and Alistair has been awesome. He has given me support through the whole journey. He is not a typical developer and will bend over backwards to help you. This is not a big city thing where you are just a number. This is a place where people really value relationships,” she says. Although it has taken a long time to successfully subdivide 44 hectares, Alistair says making sure everything has been done just right is rewarding. “Seeing people build their new houses, with lovely outlooks and situations, and so much excitement around has been a great thing to be part of,” he says. Marie is looking forward to celebrating moving into her new house. “I certainly will be having some drinks on once I move in, to welcome friends and say thanks to everyone who has helped, though I need to grow some grass around the property first. I don’t want people to tramp mud into the new house!” she says.